Sorry for my lack of posting lately. 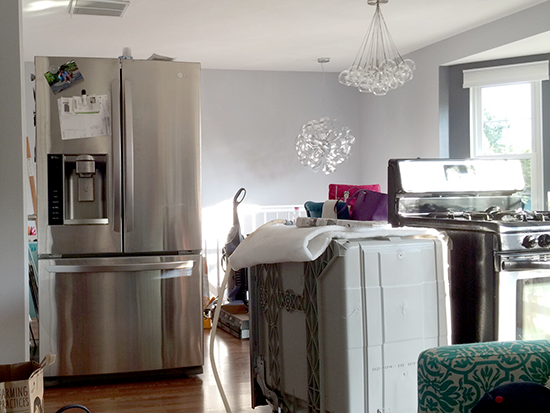 My kitchen is currently sitting in my living room. Over the past year, the boyfriend and I have been updating, renovating and decorating our first house. We have been putting off renovating the kitchen because it is the biggest job in the house. We pulled up the old flooring (three layers of tile, Peel & stick tile and linoleum) on Saturday. Re-tiling of the kitchen has taken up the past few days with grout planned for the weekend. We still have to choose a paint color, paint and then install a backsplash. We'll probably be out of the kitchen for another week or so. Luckily, I had time to put the finishing touches on these bad boys before pulling the appliances out of the kitchen. I've been looking forward to recreating this classic candy in my kitchen. It took a few tries to get the layers right, but the final product is so fantastic! Rather than coating the entire candy in chocolate, I went with the simpler option and built the candy bar in layers in a 8x8-inch pan. First went in a layer of chocolate. Next I made and pressed in the peanut butter nougat. After setting overnight, I made three different batches of caramel before finally making one that I was happy with. I stirred in the peanuts and poured it over the top. Once the caramel set up, I added the final layer of chocolate. Do these bars taste exactly like a Snickers Bar? No. But they do taste delicious. They are also a labor of love. 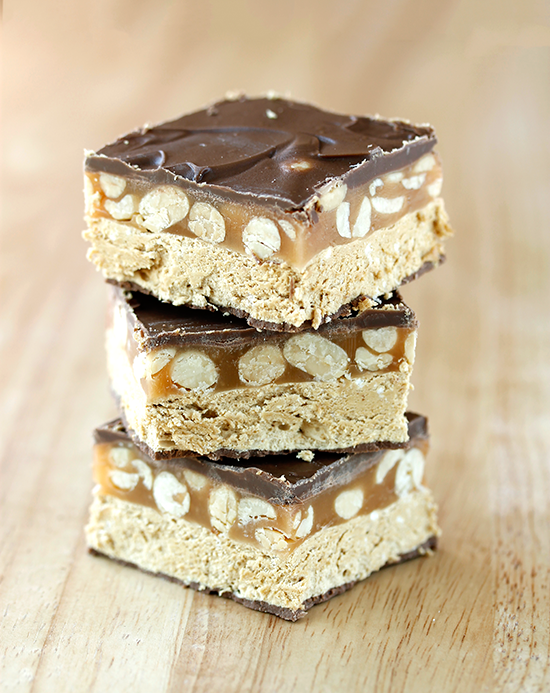 There are several other Snickers Bars recipes out there on the internet that are easier to put together. If you want to make everything from scratch and avoid ingredients like marshmallow fluff and store-bought caramels, give this a try! Though, after all the trouble I had with the caramel layer, I might go with the easy way out next time! Spray an 8x8-inch square pan with cooking spray. Line with plastic wrap and press into the corners. Melt 1 1/2 cups semi-sweet chocolate chips in the microwave or in a double boiler. Pour melted chocolate into the prepared pan and spread with an offset spatula. Allow chocolate to set for approximately 1 hour. Combine egg white, corn syrup and vanilla in the bowl of a stand mixer with whip attachment. Do not start whipping yet. Combine sugar, water and molasses in a 4-quart pot. Bring to a boil over medium heat. Once sugar has dissolved, clip on a candy thermometer. Do not stir and let temperature come up to 233 °F. Turn on stand mixer and start whipping the egg white. Egg white should reach stiff peak stage by the time the sugar syrup is ready. Allow sugar syrup to continue boiling until it reaches 252-254 °F. Remove from the heat and begin slowly streaming the syrup into the running stand mixer. Once all of the syrup has been added, continue whipping for another 4 minutes. Sift together milk powder and powdered sugar. Add to the mixing bowl and stir in with a rubber spatula. Once the solids have been incorporated, add peanut butter and stir to combine. Press approximately 1/3 of the candy mixture on top of the chocolate layer. Let the candy set up overnight. Coat a 9x13-inch baking dish with cooking spray. Press remaining candy mixture into the pan. You can cut this extra candy into 1-inch squares and coat them in chocolate. 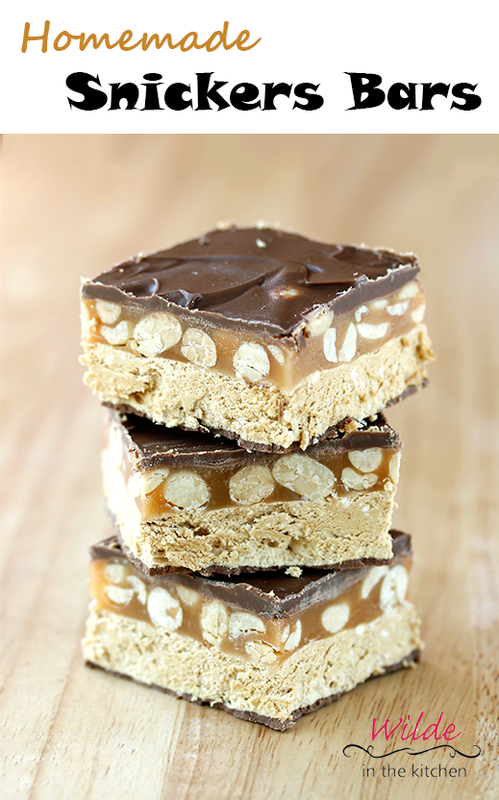 The peanut butter nougat is delicious on its own too! Combine sugar, light cream and corn syrup in a 4-quart, tall-sided pan. Heat pan over medium heat until the contents comes to a boil. Clip on candy thermometer and heat until syrup reaches 245 °F. Remove pan from the heat and add vanilla extract. Stir in peanuts. Pour over the nougat layer and spread to an even layer. You can oil your hands and use them to press the caramel into place. Let caramel cool for 3 hours. Melt 1 cup of semi-sweet chocolate chips, pour over the top of the caramel. Spread to an even thickness with an offset spatula. Let the chocolate cool and harden, at least 1 hour. Remove candy slab from the pan by lifting up the edges of the plastic wrap. Cut into 1-inch squares, or larger if you're feeling crazy! Enjoy!